JB's Warehouse & Curio Emporium: to be continued? "Windsbraut"(Bride of the Wind) by Oscar Kokoschka. Cover of History of the 20th Century #96 (1969). In the aftermath of the recent American election, there’s plenty of apocalyptic doom-and-gloom out there. How much is justified remains to be seen, though early glimmers aren’t heartwarming. Even a couple of weeks later, getting off/modifying social media to save one’s sanity, or, after doing some contemplative soul-searching, figuring out how you can actually make a real difference in your community or beyond seems like the best advice. Feeling meh or worse about the future is nothing new. Throughout recorded history, fears the sky was falling, or worse, are recurring themes during stressful times. The current malaise made me think of the one of the grimmest-ending essays I read when I was younger. Behind my dad’s chair in the basement of my childhood home was a bookshelf filled with historical “partworks”—magazine series, mostly British, mostly from the early 1970s, which covered a particular topic, usually in around 100-130 issues. These series ranged from histories of the World Wars to A History of the English-Speaking Peoples, which serialized Winston Churchill’s books with added contextual content. I loved flipping through these series, initially for the colourful diagrams and pictures, then slowly appreciating the rest of the content. 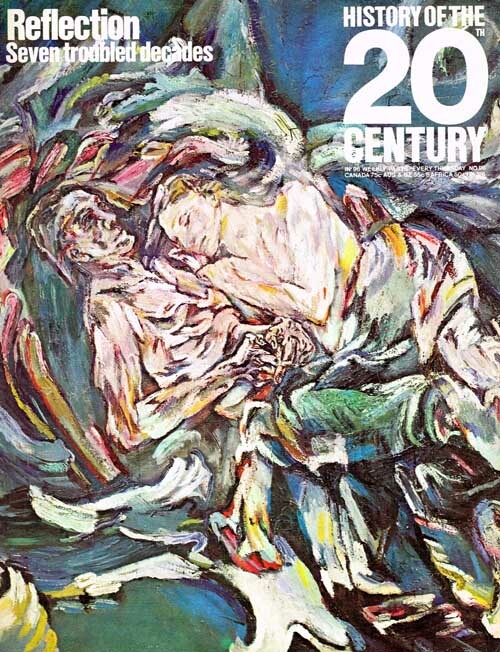 One of my favourites was History of the 20th Century, originally published in 1968-69. Its 96 issues introduced me to the scope of the era which shaped the world I was living in, and provided some answers as to who the heck those weird old guys in my postage stamp collection were. The years it was published saw dizzying change in the midst of the Cold War—Prague Spring, protests in Paris, Biafra, the Vietnam war, coups galore, the election of Nixon, the moon walk, etc. The last issue was dedicated to reflections from editor-in-chief A.J.P. Taylor and general editor J.M. Roberts on the first seven decades of the century, and what was to come. Their mood was not optimistic. All that can be said is that perhaps more reason to be generally gloomy about present trends than had our predecessors. This is mainly because of the nuclear weapon. The possibility of its use is so depressing a prospect that it should not be over-dramatized. There is a possibility that life itself might be ended on this planet, but probably things would not be that bad. Somewhere, men would survive. And it is important to remember that they would not survive in stone-age conditions: they would survive with the knowledge and skills of 20th-century men. The possibility of making an eventual recovery would be rather greater than, say, that faced by stone-age man at the onset of an ice age. This, however, is hardly the point. There would still be untold suffering, loss of life, and destruction of most of what makes it tolerable and enjoyable for perhaps a majority of the world’s population. This danger is very real. It is not real because there is anything in nuclear weapons which makes the men who have to control them any more foolish or more immoral than their predecessors. That is just the trouble. Men seem much the same. All that have changed are the consequences of error. In the past, mankind has shown no capacity to avoid conflict except for limited periods and in limited areas. All that now has to happen is that this continues to be true. Sooner or later, this will be likely to lead to a situation where people behave exactly as they have in the past in defence of their interests, but rely on nuclear weapons to do so. When that happens, the danger will be very great indeed. There is nothing new to prevent this situation arising except the knowledge we all share of the terrible destructive power of nuclear weapons. It is a pretty fragile restraint, given some of the political passions loose In the world today. This is why we must be gloomy if we think of the future as simply the continuation of present trends. Perhaps we shall be surprised. If we are, and some effective renunciation of nuclear weapons is achieved, or if we are not, and the nuclear war breaks out, the 20th century seems likely still to provide something different from the past. In either case, what would happen would be one of the most complete discontinuities in human history yet. How I suspect, outside of historians and viewers of old British documentaries, many people know the name A.J.P. Taylor. Monty Python's Flying Circus, 1970. But that was only the warmup for Taylor’s essay, whose ominous tone was set in its title (“To Be Continued?”) and accompanying images of missiles. Around the middle of the essay comes a passage that some might see as relevant to their current uneasiness about the state of the world. When people read history, they do so not only to learn about the past. They also hope to learn about the future. They ask the historian “What is going to happen next?” The historian is no better qualified than anyone else to provide an answer. The study enables us to understand the past better—no more and no less. It gives us no insight at all into the future. The most the historian or anyone else can say is that, if men behaved in the past, this or that is likely to happen. The difficulty is that men do not always go on behaving as they used to behave. As the essay draws to its close, Taylor contemplates the nuclear arms race between the Americans and the Soviets, and how the world was menaced by the potential for an accidental holocaust. The final paragraph was at first laughable to a younger me, as the 20th century was still unfolding around me and the Cold War drew to a close, but has grown on me over the years as a sense of the palpable fear people had that eventually we would blow ourselves up. While reading the following, keep in mind that the Cuban Missile Crisis was still a recent memory, Dr. Strangelove had been in theatres five years earlier, and the blasts at Hiroshima and Nagasaki were only a quarter-century in the past. The behaviour of mankind has changed. I doubt whether it has changed enough to prevent a nuclear war. When two great powers run an arms race, war is the inevitable conclusion, if history is any guide. I had contemplated a final word of advice to our successors who will design a new history of the 20th century thirty years hence. It is unlikely that this advice would prove of any use. Before then history will have come to a full stop. I can’t predict what will unfold the next four years. None of us can. But the president-elect is one of several loose cannons around the world right now, brought to power through an angry, restless public or authoritarian means. Where populism is surging, we’re dealing with a public who has forgotten, or prefers to overlook, past examples of humanity’s inhumanity toward each other. With little direct experience of war or cultural repression, it’s easy to think that it’s fine to act on your darkest impulses. If you can’t have something, whether it’s a stable job or the unshakable command of my world you once experienced, nobody else should either. Anything you fear needs to be eliminated, no matter how realistic that fear is. Periods of change are difficult. Combating fear is difficult and painful. It requires skill, nuance, the shaking off of complacency, and brokering occasional arrangements/compromises to reach a better understanding among us (though there are people whom trying to reach out is all but useless on either side of the fence). I’m still sorting out what I can do—I suppose at worst I can continue to offer historical context at appropriate moments in my professional work, even if that sometimes feels like I’m preaching to the converted. It’s a battle we all need to tackle before we succumb to any of the apocalyptic visions out there. "12 and 6, in a plain wrapper"